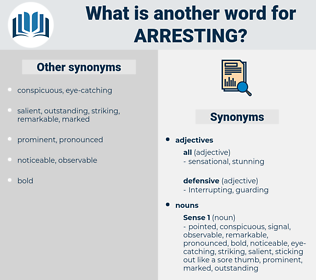 What is another word for arresting? Ceasing, Restraining, Stoping, catching, Confiscating, counterbalancing, seizing, understanding, Terminating, Deterring, discouraging, arriving, Discovering, Suppressing, regulating, Discontinuing, constraining, Initiating, retiring, trapping, Adjusting, Counteracting, Stemming, thwarting, Obstructing, Eradicating, busting, Establishing, Suspending, Mitigating, Reversing, Pausing, Curtailing, Stating, stifling, Preventing, beating, braking, determining, reaching, grasping, Elaborating, Interrupting, captivating, contain, Containing, countering, finalizing, agreeing, entering, Hampering, setting, pursuing, Reining, Checking, impeding, breaking, offsetting, hindering, curbing, governing, tackling, attacking, switching, barring, inhibiting, crushing, Occurring, dampening, Attaching, ending, defining, Conceiving, deciding, Gaining, Adopting, walking, stunt, stunting, Choosing, controlling, parking, Kidding, slowing, Combating, driving, Anchoring, blocking, approaching, bringing, hunting, coding, fixing, looking, viewing, taking, stopping, Detaining, staging. stopping, Detaining, arrested, apprehension, detain. usual, unimportant, homely, ordinary, ugly, normal, unimpressive. insignificant, subdued, discouraging, drab, unassuming, dim, disheartening, dispiriting, demoralizing, uninteresting, restrained, dry, obscure, humdrum, faint, unremarkable, modest, unpretentious, hidden, unobtrusive, unemphatic, unflashy, conservative, tiresome, tedious, subtle, unaffected, tiring, unexciting, muted, dull, monotonous, pedantic, wearying, undistinguished, pedestrian, heavy, simple, concealed, quiet, dreary, sterile, understated, toned down, boring, wearisome, Operose, plain. This, seemingly, was very good advice, and would have worked all right under other circumstances; but when it is remembered that the very officers - the constable who would have to do the arresting, the judge who would try the cases, and in fact all concerned - were men who were themselves leaders of the mob, you will see how useless such a course would be. Arresting gear for planes which would presently land.